The third installment of the MagMods book club comes from Michael Rozendal, Assistant Professor of Rhetoric and Language at the University of San Francisco. His research focuses on the overlap between modernist and proletarian writers in the print culture of the 1930s. His recent work has focused on the institutionalization of these radicalisms in the late thirties and has incorporated teaching about the literary subcultures of San Francisco. 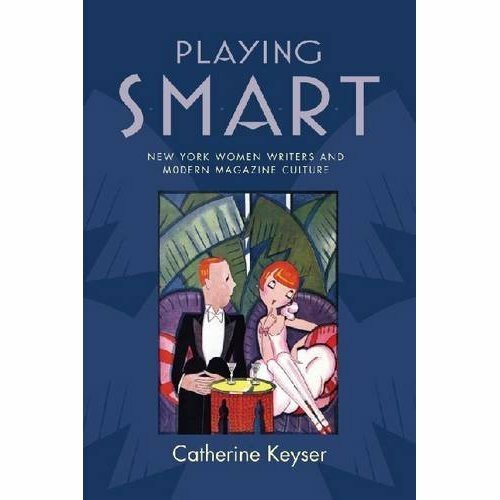 It has been a pleasure to read Catherine Keyser’s exploration of the development of smart interwar magazines as a liberating yet deeply problematic cultural formation. She explores the ways that this gendered nexus of wit and physical polish, independence and conspicuous consumption offers increasingly public spaces for writers like Edna St. Vincent Millay, Dorothy Parker, and other figures who have been largely dismissed from canonical narratives for falling too far into the popular. Keyser’s account of these authors’ self-awareness at this crux of often conservative gender roles and personal celebrity is striking, but for this post I am most interested in exploring the later developments of the thirties/early forties that she explores in her chapter on Mary McCarthy. In what ways is the thirties a horizon to smartness? Is it the waning of the promise of liberation through urbane performance? Is it the hardening of gendered hierarchies in the magazines? Is it the shift from the flapper to the gun Moll that David Earle sketched at the MSA? Is it the dispersal of irony as a general postmodern stance (as Daniel nods toward in his post)? Is it the institutionalization of the “middlebrow” magazines? McCarthy is a liminal figure in so many ways here. Where Parker and Millay were important producers of smart as a public persona, McCarthy is a product of the magazines, growing up on their formulas and promise in the Pacific Northwest and dreaming of New York. For McCarthy, playing smart is already an established role, not a novel experiment. Radicalized in the thirties and central to the Partisan Review crowd that would loom large over the mid-century culture wars, McCarthy presents the most extended questioning of the politics of irony (compellingly explored by Keyser). In many ways, McCarthy is a strange figure for the continuation of middlebrow humorists because the New York Intellectuals would fulminate so much against this, setting themselves against a femininized modernity of consumption, poses, and the new of advertising. While the PR crowd distanced themselves from much of the proletarian early thirties they grew out of, their stance of strapping masculinity remains. Against the thirties background, McCarthy’s self definition through irony is all the more striking, though also reinforcing the ways that PR differentiated itself from the broader cultural field. Urbanity, polish, femininity announce their distance from the rough wood cuts, direct expression, and regional identities that had defined the explosion of proletarian mags from ’31 through ’35, encompassing the first incarnation of Partisan Review as an organ of the John Reed Clubs. At the same time, irony runs directly against the competing leftist modernism of the Objectivists with their calls for sincerity and objectification. At the same time, McCarthy herself seems to come up against the limitations of this ironic urbanity quite quickly as well. Keyser, through her careful consideration of the collection of stories The Company that She Keeps (1942) finds a nuanced engagement with irony in McCarthy that is used to unmask snobbery, bad faith, and complicity in the bourgeois frame that these radical figures are supposedly critiquing. At the same time, the narrative reveals irony as self-serving, an avoidance of self-reflection, a substitute for action. In the end, I am convinced that irony is a critical frame for exploring the gendered terrain of mid-century politics and publication. It is precisely because of this that I’d like to see more attention to McCarthy’s work in the magazines of the period. In Keyser’s careful focus on the collection of stories (necessary to capture the texture of humor and irony? ), McCarthy’s work in the magazines is thematized rather than addressed directly. In what ways did McCarthy refigure the possibilities of the smart magazines in the determinedly intellectual mid-century formations? Do McCarthy’s later rejections of irony point to the ways that the promises of the smart magazines had already been eclipsed by the mid century? At this moment of intensely felt divide between high and mass culture, was a personal rapprochement for McCarthy even possible? This entry was posted in Commentary, Events, Publications and tagged book club, Catherine Keyser, Mary McCarthy. Bookmark the permalink.